Welcome to Day 7, if you are just arriving for the first time all the details and the linkup can be found HERE. Excited to share today that our sponsor is Ellen Hutson and I have teachers from The Classroom as my guests! Ellen Hutson is generously offering a $50 gift certificate for the Ellen Huston store.There are so many prizes to be won already from commenting her and hopping around to the designers blogs and don't forget by playing along yourself! What a fun lot of cards today! They're all so cute and inspiring but I'm totally loving that little snowman on Julie E's tag and Tracey, your water colored mason jar scene is top on my list too. So darling!! What amazing inspiration! This is the first time I'll be making tags. I love the black silhouette of Santa and his reindeer flying through the sky and the white cutout houses against the white tag. SO striking! Oh Tracey! I love your village scene in a mason jar! You are my inspiration today. Oh wow these are all so fun and creative!! Love the dimensional details on all of them really! :) Thanks for sharing! Today's group of tags is so fun and colorful! Today, I am really inspired by Kittie's tag! I love the little houses and the bright green trees! I love how diverse the various tags are today! And all beautiful, of course, with such a talented group of people. And your little bell embellishment is so cute on yours, Tracey! Sweet colouring as well. 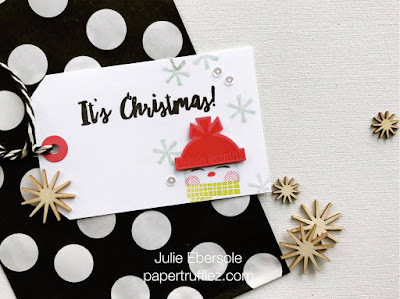 I first loved the white tag with white houses and then the black sleigh and reindeer, then I see Julie's snowman face with that adorable hat and love that too! 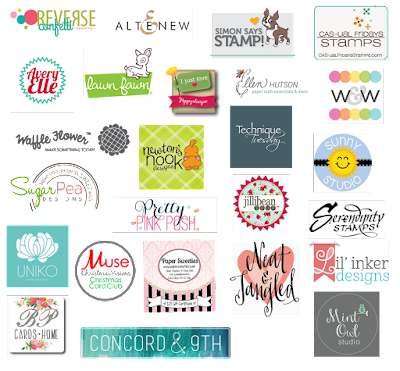 This is so fun to see so many different tags from so many different companies!! 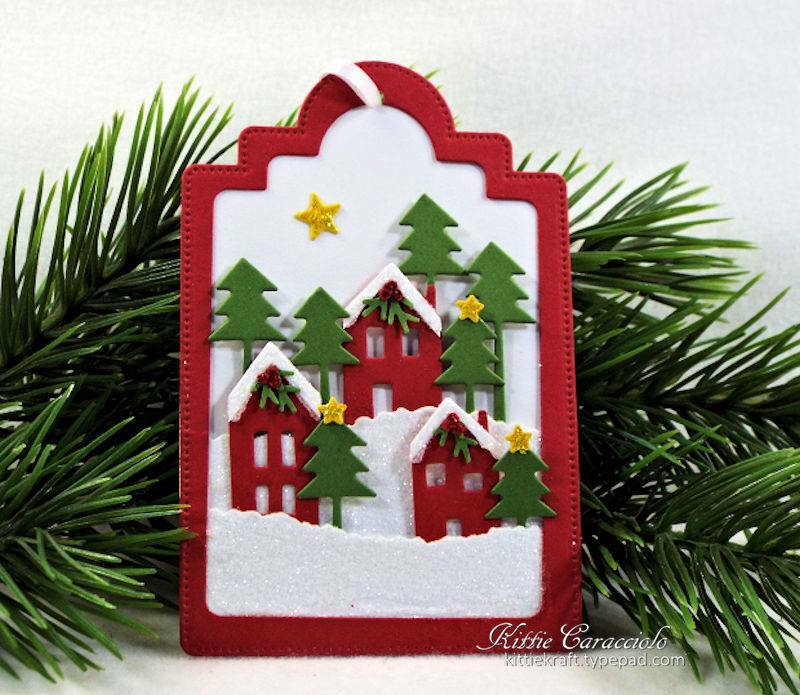 They're all inspiring, but I especially love Kittie's little village & your addition of the red bell! Love the little scenes on the tag. your tag is great too. The little houses are so cute! It's so much fun to see the different tags each day - thanks so much! Wow, what an amazing group of tags! I love the Christmas trees by Carolyn Peeler the most, but it was hard to pick just one. So many cute tags. I love the little houses scene by Kittie. And also yours Tracey with the mason jar. Oh I love the idea of the tag in the bag! 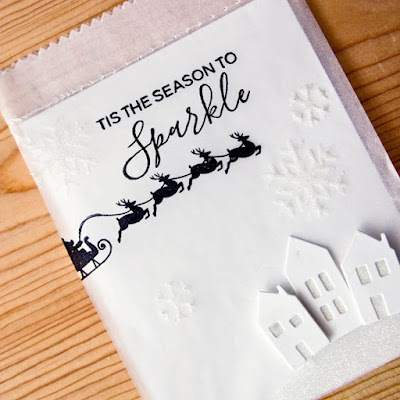 All gorgeous and inspiring in their own ways... but Kittie's tag is just begging me to do my own simplified version with one of my all time favourite dies. It was Carolyn's tag that inspired me to sit right down and make one. Tracey. There is no link to her tag though so I googled her name and found her blog. WONDERFUL tags! Love those little houses and trees on Kittie's tag! What a wonderful group of tags. All so fun & different in their own way. Thanks so much. Fantastic inspiration! 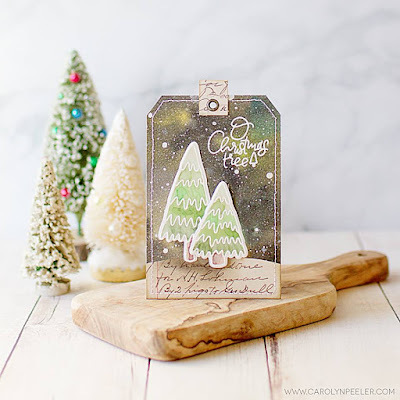 I especially love the wintery scene on Carolyn's tag!! So much beautiful inspiration from the team, and I LOVE your tag, Tracey! 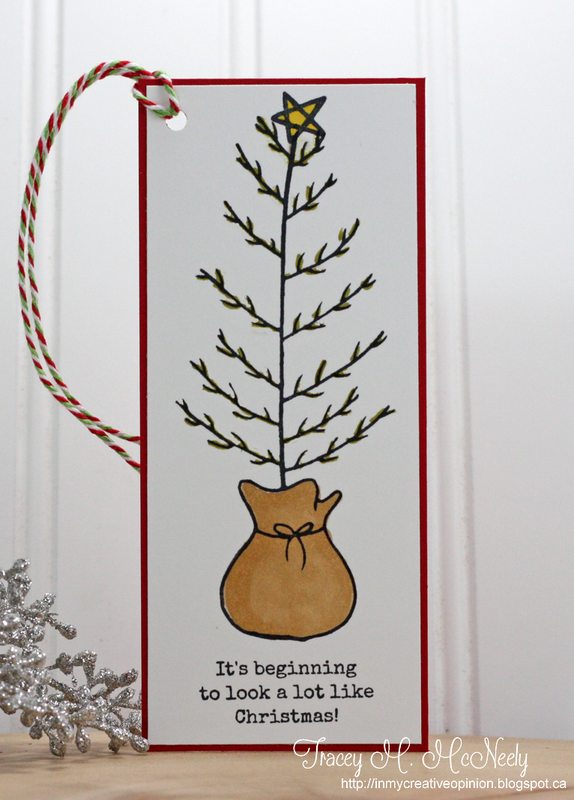 Your little Charlie Brown Christmas tree propped up with this sweet bag is so charming...Love it! Love the black and white with the snowman tag. Love all of these. So much inspiration. I really love the ones with the little houses. Kittie's little village certainly is an inspiration for me - love all of the tags tho!! I love the EH crew! Kittie's tag is SO SO cute. Reminds me of the tag I made yesterday - with the little houses against the snow - of course hers is perfect, like everything she accomplishes. And, Carolyn Peeler's gorgeous tag "glows!" Did you change your mind about your tag? There's a different one on the Feedly post... Anyway I love that skinny little tree - so cute! Totally diggin' Julie's card too. So sweet...love your wee tree! So many fantastic tags! 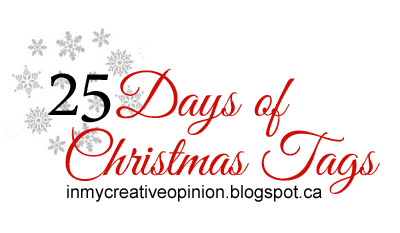 I think the one that is inspiring me the most is the "O Christmas Tree" tag. The background is fabulous! All the tags are fabulous! Love that little peek-a-boo snowman! How fun these tags are! I adore your cut little tree! So many things to be inspired by....but I love the little houses on a couple of the tags. I think I need to add those to my stash! Inspired by the houses on Carly and Kittie's tags! Oh wow!!! Awesome tags!!! I love so much the mix of different ornaments!!! Tracey's tag reminds me of "A Charlie Brown Christmas" and that sad little tree in the story. I never get tired of that film. Beautiful! Each tag is a winner, and am loving the tiny houses on a couple of these! I love your tag Tracey! I'm a big fan of clean and simple!! Such fun tags. The one that caught my eye today is Lisa's tag, but I love the others too. I have to say all of the tags are beautiful. I really love Carolyn's tag, the background is fantastic! Your's is also one of my favs. Tracey as I love the simplicity of it! Oh my goodness, how CUTE is your tag!! Awesome inspiration from the EH team!! WOW, just fun to see all the ideas. I just love your tall tag Tracey! Today's inspiration is just amazing. I don't know which one I like best!! I do really like the black and white by Carly. But Carolyn Peeler...that is just amazing!!! Awesome inspirations on today's Tags, so creative, Love the cute little houses on Kitties Tag and your's is so gorgeous too Tracey! All the tags today are wonderful. I'm inspired by Carolyn Peeler's tag, I want to make a galaxy background. Such fun tags! Love the stag images, how creative! What am I not inspired by?! These are all fabulous! I'm having so much fun looking at these! 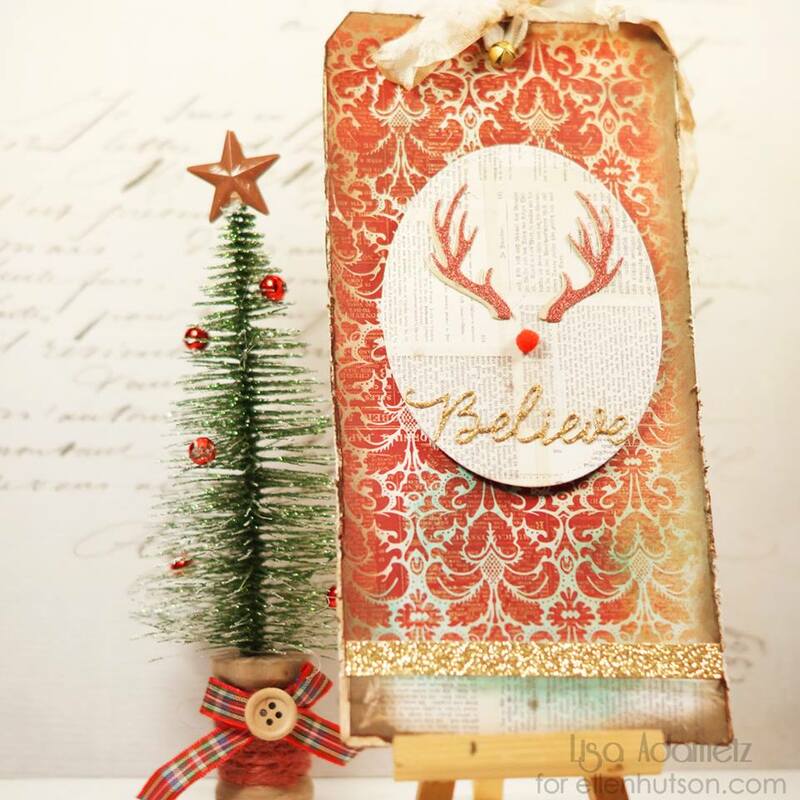 Who knew you could make such an impact on a tag design with just antlers and a red pom pom! Really love Lisa's tag. Thanks for another great bunch of tags. What inspires me from this group is that one with the Peace joy and Love with the reindeer on it that Julia Stainton made. Fabulous! Thanks for sharing. Such beautiful tags!! What really inspires me is the town tag with tiny houses! Beautiful tags. I like the scene Kittie made and your cute tree tag. I loved your tag today! So adorable. I loved the background with the trees... now if only mine had turned out like that... and using patterned paper for the base, I should think about those things more often, mix it up. Wonderful tags - like them all! Kitty's sweet little layered Christmas village scene is my favorite! This just makes me smile. Love your sweet tree, Tracey! And I'm so in awe of Carolyn's northern lights sky and wonderful vellum trees!! Oh, wow -- these tags are all amazing and eye-catching!! Carolyn's background is fabulous (I need to try that, Julie and Kittie's are TOO adorable! The all white card with Santa's sleigh flying through the sky is just beautiful! I feel inspired to try to create a little scene on my tags; so cute! I adore the little red houses! These tags are so so beautiful...Love each one of them..
Gorgeous mix of whimsical and traditional look of these tags. Awesome tags. Love the background with the deer antlers so pretty with all the gorgeous background detail. I can't decide which one of these adorable tags inspired me most - they're all simply wonderful. Oh, WoW! That night sky is just FABULOUS as is the script snow dune! These are all so beautiful! Hard to pick one but it will have to be the layered houses. I love the dimension on the tag. Gorgeous - one and all! Julia's is so clever! I was inspired to Want to make a shaker bag using Ellen Hutson 40 lb vellum from looking at the white glassine bag of Carly's tag. I'm totally inspired by Carolyn's Northern Lights background - so pretty! 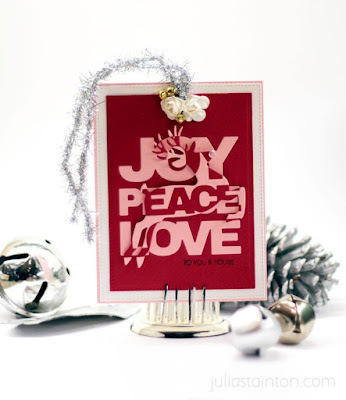 Tracey as we get closer to Christmas the simplicity of your tag holds much more inspiration for me than any others. For all its simplicity it is so cute. All of the tags are lovely, but Carolyn's tag really caught my eye. Great work. SO much EH to love! But Julie's snowman tag is just THE cutest! !